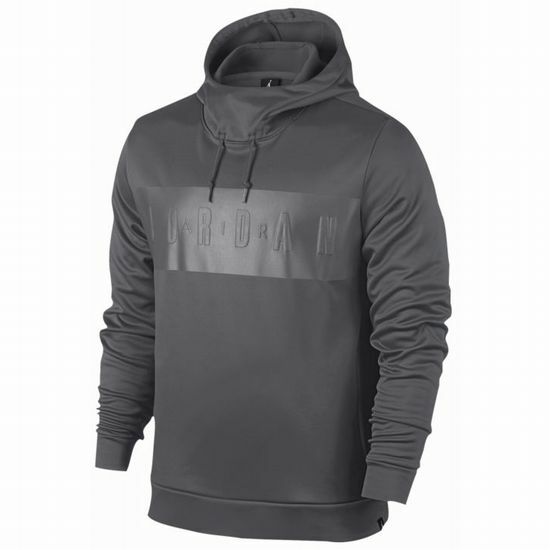 JORDAN THERMA LITE PULL OVER HOODIE バスケットボールの神様、マイケルジョーダンのラインJORDAN！！ ストリートバスケとストリートファッションが融合され優れた機能性とデザインから世界的ヒット商品となる。 肌触りもよく着心地バツグン!! メンズサイズですが、女性が着用してもGOOD! Look like a legend, play like a legend. Nike Therma fabric helps keep you warm and comfortable. Articulated seam construction for natural movement. Four-panel performance hood has a crumple zone at the base that lets you move freely. Drawcords at the base of the hood help secure the fit. 100% polyester. Imported.